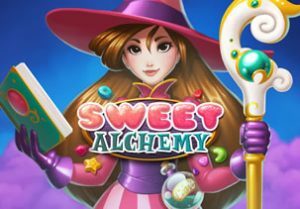 Try and conjure up the Elixir of Power in Sweet Alchemy, a sugary magic themed slot game from Play ’N Go. It’s played using a 5x5 cascading reels grid and comes with plenty of wild extras if you get on a winning run. Play this extremely volatile game from between 10p and £100 per spin. There’s a bright and colourful feel to the design in Sweet Alchemy. Set against a cloud-filled, blue backdrop, you’ll see 7 different sweets symbols. Rather than paylines, winning combinations are formed by matching clusters of matching symbols. Land a cluster of 8 or more of the top paying heart symbol and you’ll pocket a payout of 30 times your stake. 6 symbols - 2 regular wilds replace 2 standard symbols on the grid. 13 symbols - 2 striped wilds replace 2 standard symbols. If a striped wild forms part of a winner, all of the symbols from that row or column are removed and contribute to the Sugar Rush Meter. 25 symbols - 2 dotted wilds replace the 2 standard symbols here. When these form part of a winner, 1 symbol is chosen at random. All instances of this symbol are removed from the reels and added to the Sugar Rush Meter. 38 symbols - if you manage to fill all 38 spaces on the Sugar Rush Meter, you’ll trigger the Mix the Elixir Free Games feature. This Mix the Elixir Free Games feature is played on an expanded 9x9 grid. Helping you to try and clear the board are Candy Spells – you begin with 3 to 7 of them depending on how many winning symbols you got when triggering the feature. These Candy Spells can shuffle symbols to create new winning combinations, add between 7 and 12 wilds symbols or replace and destroy between 7 and 15 standard symbols. Collecting specific symbols will help you work your way through the levels. There are 3 levels to complete with expanded payouts on offer in each of them – if you complete level 3, you can win a multiplier up to 10x (which is applied to your winnings from the Candy Spells spins). Finish the free round and you’ll get to work your way along a map and open treasure chests which award cash prizes of 15% times your total winnings from the base game from when you last entered the Mix the Elixir Free Games feature. Cascading reels slot games are often simple affairs, sometimes spiced up with expanding multipliers. Play ’N Go has packed in a lot more here. All those extras can take a little getting used to so we recommend a few spins in demo mode first. The visuals in Sweet Alchemy might be sugary but this is a volatile game with top payouts of 3,000 times stake. That may all sound a little complicated for a slot game that’s based on sweeties. All you really need to know is that get on a roll with the cascading wins and Sweet Alchemy can conjure up some very tasty action.